It’s tough enough dealing with chronic back pain all day, without having to deal with it all night as well. But unfortunately, that’s what many people with back pain have to endure. Lack of sleep resulting from back pain can lead to further health problems, so it’s imperative to get a good night’s sleep. If you have back pain and you are experiencing trouble sleeping, there are ways to sleep comfortably without injuring your back. At Total Chiropractic Care, we are committed to helping patients manage their pain. So we want to tell you a bit about preventing back pain while sleeping. and we have some tips about keeping away neck and back pain while sleeping. The website Medical News Today lists the best sleeping positions for your back. They say that lying on your back is usually considered to be the best position to sleep on. It distributes your weight and minimizes pressure point. Sleeping with a small pillow under your knees can help align your head, neck, and spine. But what about lying on your side? This is a very common sleep position but it can cause problems with your lower back, which can be pulled out of position. So, it’s recommended that if you sleep on your side, you should get into bed carefully, rolling to one side. 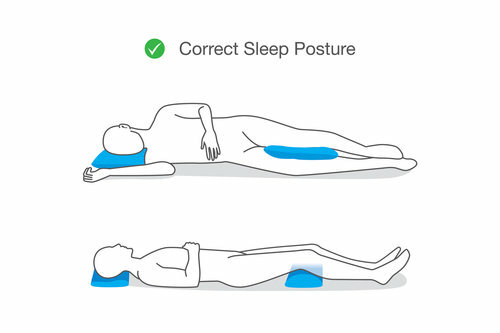 Then, position a pillow to support your head and neck. After this, place another pillow between your knees for even more support and spinal alignment. Another way you can support yourself while lying on your side is to sleep in the fetal position. Tucking your knees to your chest actually straightens out your back. Sleeping on your stomach is usually bad for back and neck pain your head is usually turned which twists the spine. It can help those with a herniated disc or degenerative disc. If this is the only position you feel comfortable with putting a pillow underneath the stomach and hips can help with spinal alignment. If you’re still encountering problems, the National Sleep Foundation suggests switching positions. If that doesn’t work, consider changing your mattress. Be careful when getting in or out of bed, and try not to make any sudden jerking motions. Regular exercise will also help you sleep better. If you’re having trouble sleeping because of your back pain, or if chronic pain is causing any other problems in your life, Total Chiropractic can help. We will consult with you and design a treatment plan that works for you. Contact us today.